The Indian Women’s National Boxing Championships was held in the city of Toranagallu which is located in the southern state of Karnataka. India’s experienced women elite boxers such as Pinky Jangra Rani, Maisnam Meena Kumari Devi, Pooja Rani and Sonia Lather Singh regained their national titles in Toranagallu. Boxing Federation of India hosted the AIBA Women’s World Boxing Championships in New Delhi last November and their boxers claimed four gold medals including one title. Some of their heroes did not attend in their Women’s National Boxing Championships in Toranagallu but most of their bests were competed for the medals. In the absence of six-time AIBA Women’s World Champion and five-time ASBC Asian Women’s Champion Chungneijang Mary Kom Hmangte a new boxer won the light flyweight (48kg). Punjab’s Manju Rani eliminated Rajni Singh in the semi-final and continued her winning path against S. Kalavani in the final of the event. At the flyweight (51kg) Commonwealth Games quarter-finalist Pinky Jangra Rani won Haryana’s first gold medal in the Indian Women’s National Boxing Championships. 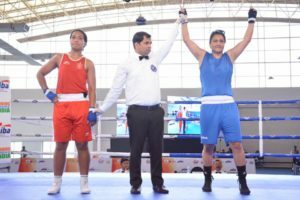 Rani, who was quarter-finalist at the New Delhi 2018 AIBA Women’s World Boxing Championships, was slightly better than former AIBA Women’s Junior World Champion Nikhat Zareen in their top level final. A top bantamweight (54kg) final was held in the National Championships between veteran Maisnam Meena Kumari Devi and Ahmet Comert Tournament winner Manisha Moun. Maisnam Meena Kumari Devi eliminated national team member Shiksha in the semi-final and she was enough patient to beat Manisha Moun in the final. India’s top hope Sonia Lather Singh claimed silver medal in the Astana 2016 AIBA Women’s World Boxing Championships and she is trying to regain her place in the national team. The experienced boxer had to face for the title of the featherweight (57kg) with AIBA Women’s Youth World Champion 19-year-old Shashi Chopra. Sonia Lather Singh used her patient style against the taller opponent and celebrated her title after the last gong. The lightweight (60kg) delivered full of surprises in the Indian Women’s National Championships which was won by Haryana’s Neeraj who defeated Preeti Beniwal in the final. 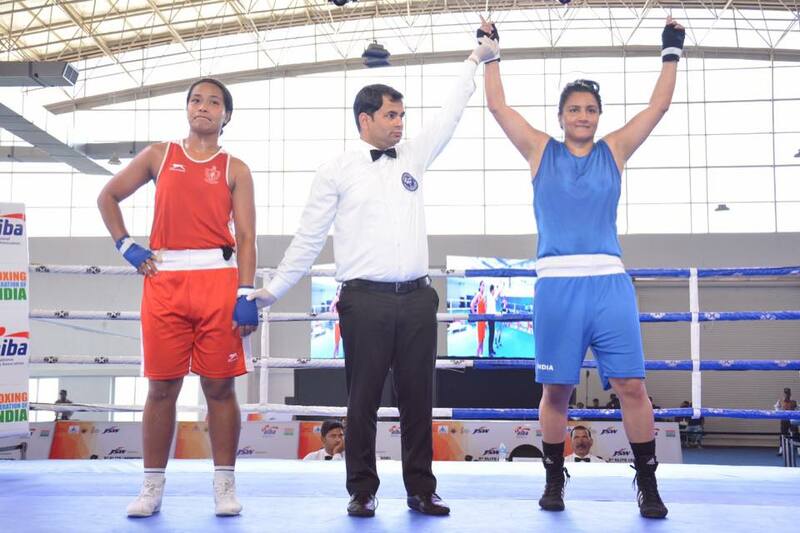 Punjab’s Simranjit Kaur claimed bronze medal in the New Delhi 2018 AIBA Women’s World Boxing Championships and gold in the Ahmet Comert Tournament therefore her success over Pwilao Basumatary was an expected result. Assam’s Lovlina Borgohain achieved also bronze at the New Delhi 2018 AIBA Women’s World Boxing Championships as Simranjit Kaur and defeated her main national rival Pooja in the final of the welterweight (69kg). Neetu was not the main favourite of the middleweight (75kg) but she was too strong for Nupur in the final of the event. Haryana’s Pooja Rani claimed silver medal in the Ulaanbaatar 2012 ASBC Asian Confederation Women’s Boxing Championships and she regained her national throne after beating AIBA Women’s World Boxing Championships competitor Bhagyabati Kachari at the light heavyweight (81kg). Seema Poonia is member of the national team at the heavyweight (+81kg) and she was slightly better than former AIBA Women’s World Boxing Championships bronze medallist Kavita Chahal.